The second lobster dish that I cooked this week was Lobster Thermidor. This recipe took a bit longer than the Butter Poached Lobster & Shrimp recipe. I added shrimp to this recipe as well to add some extra substance to the meal, since we didn’t have very much lobster meat. I found this recipe on MyRecipes from Cooking Light, but tweaked it a little. It is a healthier version of a Lobster Thermidor recipe. 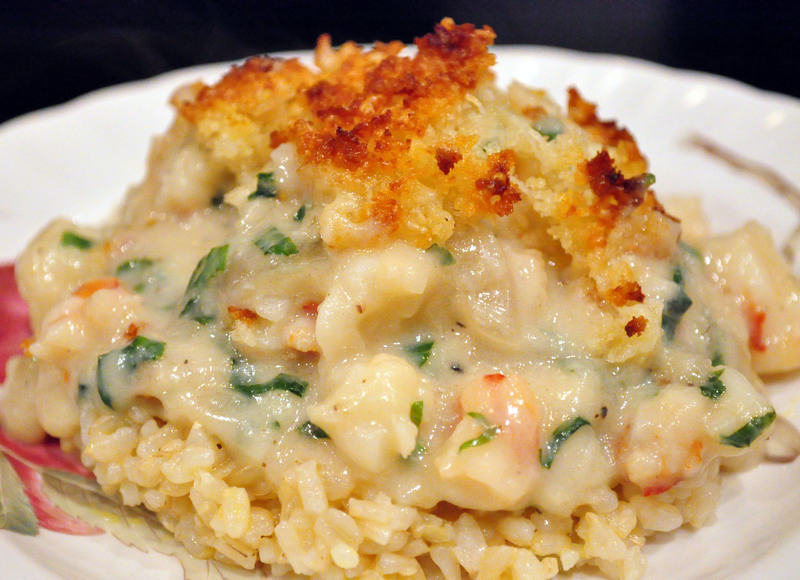 If I could afford to buy lobster more often, I would cook these two recipes all the time! Bring 3 cups of water to boil in a stockpot and place a vegetable steamer or rack on the bottom of the pot. Add the lobster tails, cover, and steam until done (about 8 minutes). Cook lobster tails to room temperature, remove meat from tails, and chop into small pieces. Then, cover and chill. 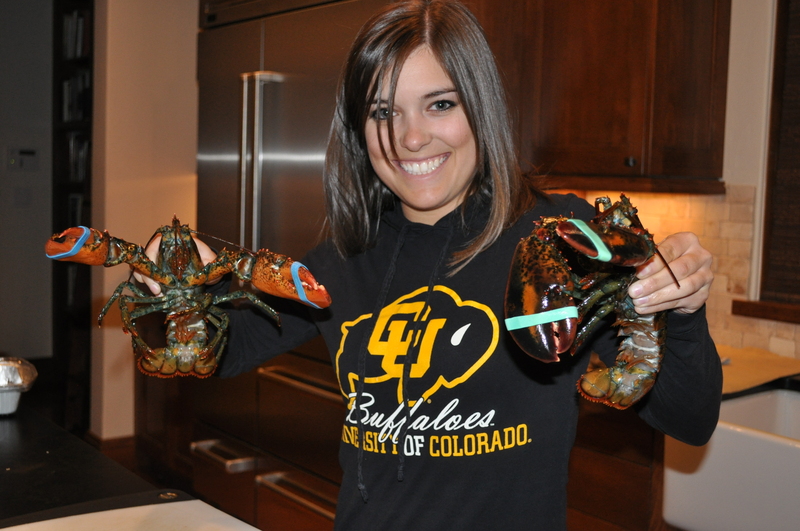 Place lobster shells in a large zip-lock bag and coarsely crush shells (using a meat mallet or rolling pin). Strain the mixture into a bowl and discard the solids. Set this mixture aside. Preheat the oven to 450F. Then, heat oil in large non-stick skillet over medium-high heat. Add the shallots and saute until soft (about 2 minutes). Then, stir in the sherry and cook for an additional minute. Combine the reserved milk, flour, and black pepper and whisk until smooth. Add milk mixture and shrimp to pan and bring to a boil. Cook until thickened (about 1 minute), stirring constantly. Stir in the basil and cook for an additional minute. Add the lobster meat, cream, and salt, stirring to combine. Cook until liquid has thickened a bit more (about 2 minutes). 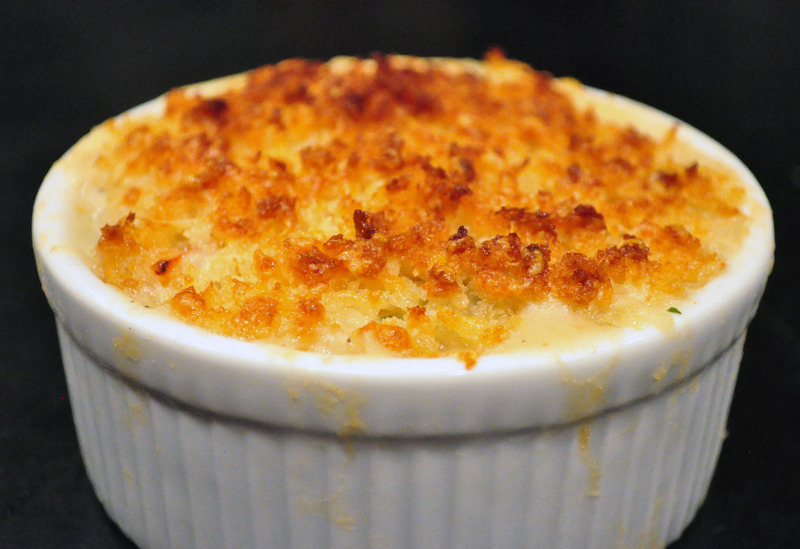 Then divide the mixture evenly among 4 small gratin dishes coated with cooking spray. Melt the butter. Then, combine the cheese, panko, and melted butter in a small bowl. Sprinkle 1/4 of the cheese mixture on top of each gratin. Bake at 450F until topping is browned (about 10-12 minutes).